The app has gotten a major makeover. Most notably, live GameDay updates no longer take place in a generic baseball stadium. Instead, the app has custom graphics representing every major-league park, courtesy of graphic assets borrowed from Sony’s MLB 11 The Show video game, as well as batters wearing a team’s official home or road uniforms. So when you’re watching a game taking place in San Francisco’s AT&T Park or Boston’s venerable Fenway Park, you’ll see that park in the background. There are more visual changes, too: The overall design of the app has been simplified, while the scoreboard has been reworked with a new block-letter typeface and background insets reminiscent of the hand-operated scoreboards of yore. The app also is using more detailed pitch-by-pitch data courtesy of Major League Baseball’s in-stadium pitch-tracking data collection system. Hitting a sign on the outfield wall does not win you a new suit, however. 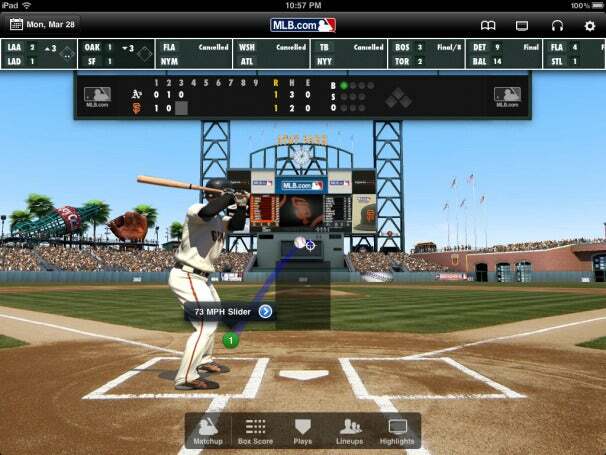 When the iPad was announced last year, one of the few apps displayed during the launch event was MLB At Bat. MLB Advanced Media had to scramble its development schedule to get that app (as well as its iPhone equivalent) ready for Opening Day 2010. This year marks the first time that the iPad app has been able to get a full offseason’s worth of development focus, and it marks a big step forward from last year’s edition. Like last year, MLB.com At Bat 11 for iPad (like its iPhone counterpart) comes with live GameDay status information, access to live home and away audio streams for every game, and access to occasional free live TV streams. Subscribers to the MLB.tv streaming-video package will also get access to live game video, though as with all MLB video packages, local teams are blacked out. There’s a lot more going on under the hood at MLB. As we get closer to Opening Day, stay tuned to Macworld for more detail on MLB.com’s iOS apps and what happens behind the scenes at the league’s New York City multimedia hub.